The Office of Disability Issues has worked with disabled people to develop the Right to Control legislation. The government has selected a small number of local ‘ trailblazer ‘authorities to test out Right to Control. Sheffield is a joint trailblazer with Barnsley. 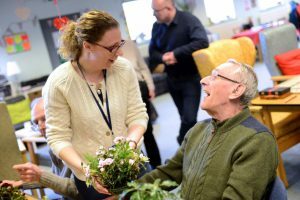 In Sheffield the trailblazer is a partnership arrangement between adult social care at the Council, Jobcentre Plus and Sheffield Centre for Independent Living. Right to Control is a new legal right from 1st March 2011 in Sheffield for disabled people and people with long term health or mental health conditions over the age of 18. Right to Control gives disabled people more control over the help they need to access social care, housing related support and employment support services. Staff in the six funding streams and Right to Control partners will be working together to improve how they deliver support to disabled people to ensure that they have greater control over the support they receive from different services. A simple ‘customer journey’, from assessment of your needs through to arranging your support. Access to professionals and organisations to help you make decisions about your outcomes and support. More choice over the support you can get with the money available to you. The Right to Control booklet provides further information. Sheffield Centre for Independent Living will develop further information to support ‘ Right to Control ‘ for disabled people in Sheffield as the partnership develops. Our organisation is supported by popular gift seller – bestvalentinegift.co.uk , who helps all of our projects to get realized.